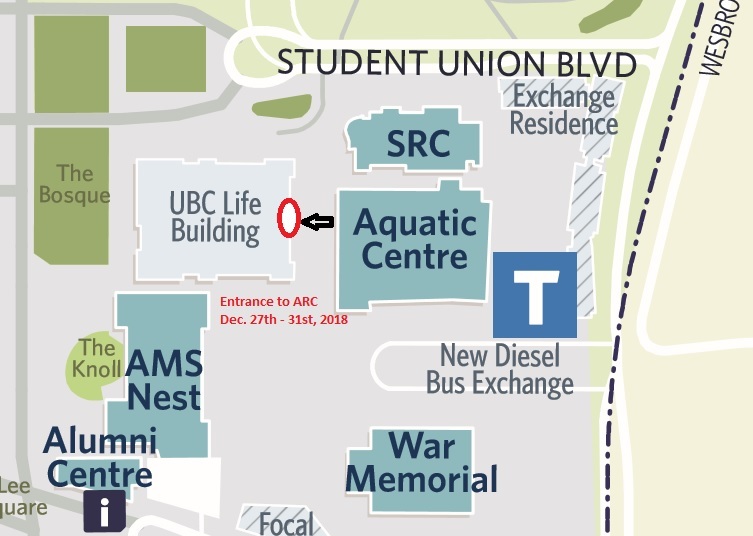 PLEASE NOTE: The only access entry and exit to the ARC Fitness Centre during our operating hours for Dec. 27th, 28th, 29th, 30th, and 31st, inclusive, will be on the east side of the Life Building, across from the Student Rec Centre and Aquatic Centre (please refer to the map). The ARC Fitness Centre will be closed on January 1st, 2019 and will reopen to regular hours on January 2nd, 2019. Thank you and sorry for any inconvenience. Happy Holidays from UBC Recreation! Please note that the Student Recreation Centre (SRC) Gymnasiums are closed for December Exams, from Dec 2, 2018 – Dec 21, 2018. Drop-in Sports will be hosted at War Memorial Gym during this time. For the most up to date schedule, please refer to the Drop-in Sports Schedule. Good luck to all students studying and writing exams!